With summer coming to a close and school on the horizon, H2O is reaching the time of the year that we affectionately call Blitz season. In football, a blitz is a defensive strategy used to disrupt the offensive scheme where a large amount of defensive players go "all in" to rush the quarterback. Similarly, at the beginning of the school year, we as a church want to go "all in," in a rush of energy to pursue freshmen. With thousands of freshman moving in next week, it's our desire to do as much as we can to reach them with the Gospel of Jesus through word and deed. Above you can see some of our student leaders, Pastor Chad and myself at a weekend Blitz Conference. We joined over 100 students from 4 different campuses in this exciting event. 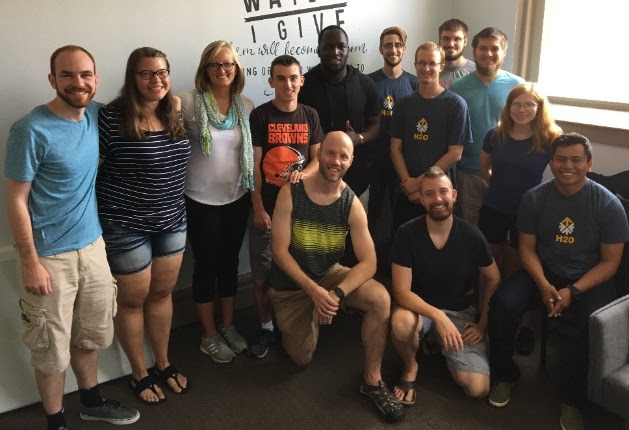 This weekend away in Bowling Green, Ohio helped us pray and prepare for all the work (and fun:) of meeting so many new faces, and hopefully seeing their lives transformed by the Gospel! To create a shared vision and mission for our student leaders, we decided to adopt a catch phrase called "FreshTEN." FreshTEN is basically this, starting this coming Wednesday, H2O will be hosting or participating in a social outreach event every day for TEN days in order to build relationships with new students. We have found that the trajectory of students lives are often set in that first Ten days while on campus, so we are going ALL INI! Please pray that our efforts will cause students to experience Jesus, build a compassionate community, and bless the University of Akron. We will also have our H2O tent set up throughout the week to hand out water bottles and cotton candy, and to connect with students. As you can see we are doing A LOT! Everything we do is to invite people into a loving community and point them to Jesus! Thank you in advance for your prayers as we aim to love students abundantly for the sake of the Gospel. I can't wait to share with you what God does in the weeks to come! ALSO- please be praying for healing as I just started treatment for strep throat. This is my favorite time in campus ministry, and the wrong time to be sick!